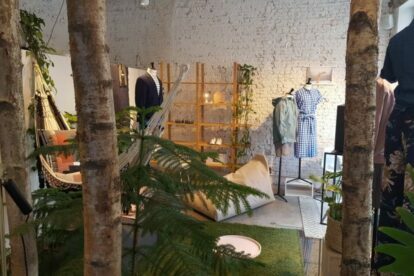 The name of the store is exactly what it stands for: Moose in the city, a moose in Antwerp, a little bit of nature connected to urban city life. Making a wishlist for my birthday, I always include something from this store, or maybe even three or four items! Some delicate porcelain plates and cups, a woolen blanket, a nice pillow for the couch, something small and shiny for the bathroom, a lovely notebook or just a gift voucher so I can choose myself. I often spend over an hour in here, admiring the new lamps, trying on some new clothes or just thinking who I can buy that beautiful book for. I always discover new items I didn’t know they had at Moose. Becoming a V.I.M. – a Very Important Moose – is one of the few goals I have not reached yet! Keep an eye on their Facebook for the subscription form.